Bar Stool Info - Bar Stool Warehouse - We Manufacture Our Own Bar Stools! The Bar Stool warehouse is a one stop shop for bar stools. We stock some of the finest wooden bar stools available in the UK for a fraction of the price you would expect to pay in a high street shop. 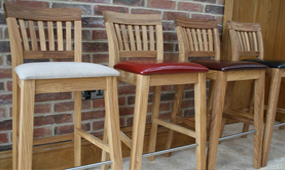 We stock thousands of oak bar stools and walnut stools in our warehouse which enables us to offer a fast delivery.